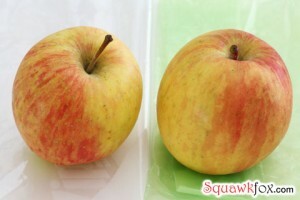 Home » Liveaboard Golden Glow Antares 44i » Best Way to Store Produce? Green Baggies or Plain Ziplocs? I’ve been hearing about Green Baggies “as seen on TV” and some friends have described them as the be-all end-all for food storage. They’re much more expensive than regular ziplocs from Costco. Are the Green Bags worth the cost? Here’s a very helpful review from KerryTaylor on just that subject. What has your experience been? 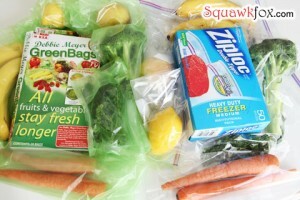 Food Waste Experiment: Are Debbie Meyer Green Bags worth it? Tasty Trash: The $55 million Squawkfox Food Waste Challenge is a series aimed at helping your family save up to $1,500 this year by reducing food waste. The environment may also thank us. To start from the beginning, read the introduction. “Save money by eliminating waste.” That’s the claim that first caught my eye when I picked up a box of Debbie Meyer Green Bags. Who doesn’t want to “prolong the life” of produce by stickin’ it in a pretty green bag designed to remove the ethylene gas that accelerates rotting? Easy. The sciency part of my brain wanted to know if this As Seen on TV product did the job it promised. My wallet wanted to cut costly food waste. So I devised an experiment. In one corner (of my refrigerator) I lovingly bagged and stored a wide variety of fruits and vegetables in those expensive Debbie Meyer Green Bags. In the other corner I zipped and sealed a complementary produce stash in comparably sized Ziploc Freezer Bags. 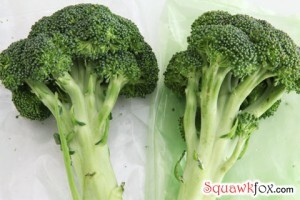 At $13.43 for a box of 20, the Debbie Meyer Green Bags cost a staggering $0.67 per bag. 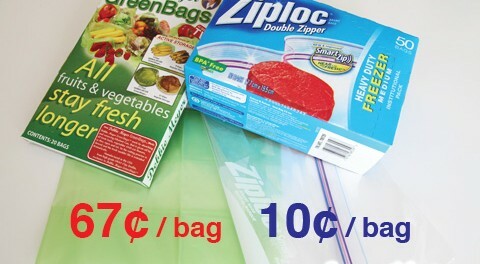 The popular Ziploc Freezer Bags retail for $0.10 a piece at Costco. 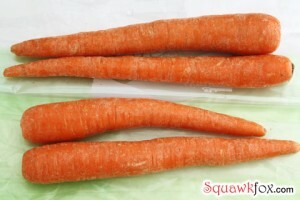 I planned to take pictures of the produce every day for 22 days. Game on. Let the produce bag wars begin! I followed the Debbie Meyer Green Bag instructions to a tee. After 22 days of refrigerating broccoli, apples, lemons, carrots and parsley, and storing bananas on my counter, I harvested these ripened results. The bananas showed the most dramatic change. For some fruity fun I sealed a pair of bananas in each bag type, plus I left a naked banana pair on the counter as a scientific control. This is real science, people. Oh, and I made a little video to serve as proof. Bananas, I know. Week One. After 7 days, all bagged bananas looked about the same. 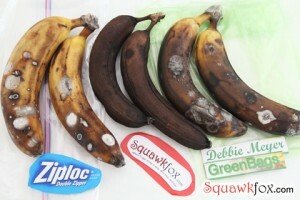 The unbagged banana control group boasted more brown spots than the bananas quarantined in bags. Week Two. After 14 days, the Debbie Meyer Green Bag bananas were as brown as the unbagged control bananas. 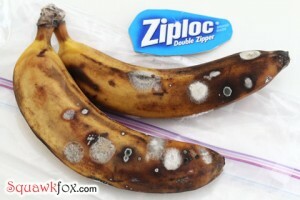 The bananas in the Ziploc bag looked best. The End. From day 16 to day 22, all bananas deteriorated quickly. 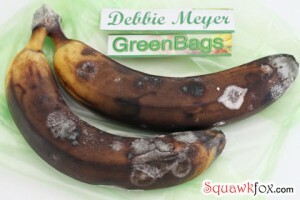 The Debbie Meyer Green Bag and Ziploc bananas developed significant moldy spots. They looked equally disgusting. 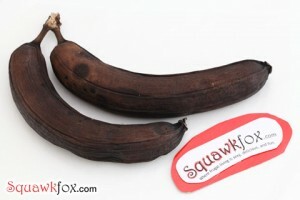 The control group (with the Squawkfox logo) turned very brown and started to shrivel, but this banana pair did not grow mold. Go science! 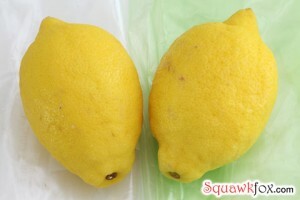 Making tasty banana bread or healthy homemade ice cream would have been more fun than watching my fruit grow mold. Ick. 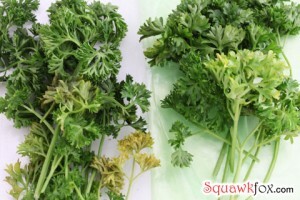 After 22 days of bagged captivity, the parsley wilted and turned yellow. Neither bag outperformed the other. Broccoli, carrots, lemons, and apples oh my! The balance of my bounty — yeah, the bagged fruits and veggies — all looked the same outside their respective bags 22 days later. 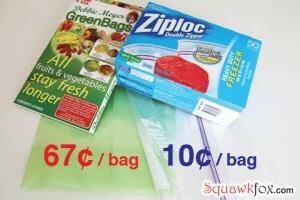 I’d say both the Debbie Meyer Green Bags and Ziploc bags performed equally well. Take a look for yourself. The costly Debbie Meyer Green Bags did not extend the life or freshness of my refrigerated produce longer than the less expensive Ziploc bags. Bagging bananas in either bag could ward off brown spots a few days longer, but after 10 days, all banana pairs were inedible. Conclusion: Save your green on green bags. If you really want to “save money by eliminating waste”, then I’d highly recommend making a grocery shopping list and planning meals around your perishables before the food goes foul. Spending good money on Debbie Meyer Green Bags won’t do a thing to extend the life of your produce if you’re not eating your fruits and veggies before their natural expiry date. Everything dies, people. And these bags are a huge waste of moolah. Kerry K. Taylor is the creator and lone writer of Squawkfox. She is the author of 397 Ways to Save Money. Learn more about Kerry. Subscribe to Squawkfox, the consumer savvy blog.